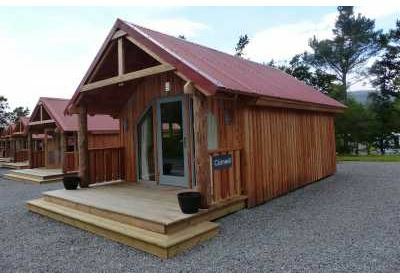 Braemar Caravan Park has 6 fantastic camping pods available for holiday rental. The camping pods each sleep up to 4 people, they are heated, carpeted, have comfortable mattresses, a microwave, mini-fridge and kettle. A perfect place to stay after exploring the hills of Invercauld Estate. Based on 2 people, the Fog pods are £55 per night Low season and £65 per night high season. Additional adults are £10 per night, additional children £5 per night. Discount is available for single person occupancy. Our Pods are dog friendly, dogs are charged at £5 per dog per night and there is a maximum of 3 dogs per pod. On site heated toilet & shower facilities are a short walk from the pods. Tea towels & Washing Up Essentials. Sleeping bags, toiletries and other essentials are available to purchase from our on-site shop. Arrival time is from 3pm and departure time is 10am. Our camping pods, which we are calling ‘Fog Pods’, have been designed especially for Braemar Caravan Park, to ensure they are in keeping with the special environment you’ll experience when you visit. Invercauld Estate has a history of providing ‘fog Houses’ from which people have enjoyed and relaxed in the beautiful surroundings of Braemar in the heart of Cairngorms National Park. These fog houses can still be seen on the Estate, and are unique structures made of wood with a moss/heather thatched roof. Strictly no arrivals after 8pm. If you are making a booking, please ensure you plan your journey to arrive no later than 8pm. Book online or call us on 01339 741373. Please ensure you have selected the correct dates when booking as no refunds will be given. Arrival time for the pods is 3pm and departure time is 10am.